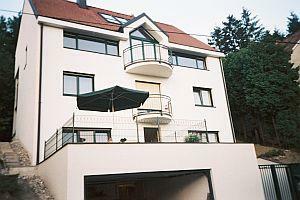 The house is located in a quiet, green, exclusive residential area in the vicinity of Schloss Sch�nbrunn and the zoo. You can have a walk ( 7 Min.) to Ernst Fuchs Museum. The nearest bus stop is 50 m from the house(5-8 min.walk)There is an excellent transport connection to the Inner City (Opera house) , which takes 20 min.